Like many of you, weather and work kept me away from the BMO this weekend. I pledged to pack in an hour of Hogs-related musings. The clock starts…now. First off, the kids down in Rockford put together a gritty weekend at home and came out with a pair of victories. 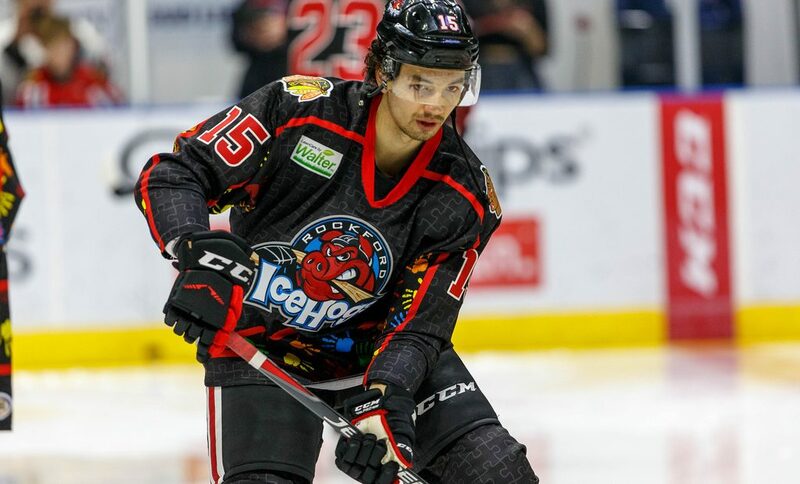 Friday night, the IceHogs tied the game with a Jordan Schroeder goal with three seconds in regulation, completing a comeback from two goals down in the final two minutes with a 4-3 shootout win over Manitoba. On Saturday, Rockford hosted Iowa. The Hogs got enough rubber past Kaapo Kahkonen knock off the Wild 3-1. The game-winner came off the stick of Terry Broadhurst early in the third period. First star of that game was Anton Forsberg, who stopped 33 of 34 Iowa shots. So…for the sixth time this season, the IceHogs have a two-game win streak. Plus, Rockford joined the rest of the AHL on the 100-goal plateau this season, though those 105 goals are still last in the league. Just once in the 2018-19 campaign has Rockford stretched a streak to three games. Conversely, the piglets have compiled losing streaks of six (twice) and four games. Rockford (19-19-3-5) shares the Central Division basement with the Moose. Both teams sport a .500 points percentage. Can the IceHogs parlay a pair of home wins into some sort of climb up the division ladder? I just don’t know. As was the case at this point last year, the piglets were not a playoff-level squad. A lot of things had to change on the personnel side in February of 2018 to transform the roster into the juggernaut that reached the conference final. As of this morning, this is not a roster that’s going to be competing for a postseason berth. Prove me wrong, boys. Are there additions from the Hawks roster that could make a difference in the next couple of months? Not unless you think Gustav Forsling can come down and have the impact Cody Franson had in Rockford the last three months of last season. Which I don’t. Even with some tinkering from above, the hole may be just a bit too deep for the Hogs to vacate. Like last year, the prospect talent alone isn’t close to being able to go on an extended tear through the league. Now, Rockford is two games into a stretch of nine home dates in a span of ten games. If this team has anything resembling a hot patch in it, now would be a great time to display that fire. Broken record, but the goalies have really been good. Kevin Lankinen and Anton Forsberg have been splitting the work in net and the Swedish Connection continue to stand out despite some less than optimal goal support. A quick look at this weekend’s AHL All-Star Classic puts things into perspective. With goalie Collin Delia in Chicago, the only representative is Western Conference captain Andrew Campbell. The veteran defenseman was not selected for his play on the ice. Anthony Louis is the team’s leading scorer with 27 points (10 G, 17 A). He’s on his way to a similar showing to last season’s 44-point effort. Dylan Sikura leads the team with 12 goals to go with a dozen assists. Jacob Nilsson picked up his 11th goal this weekend, while Louis and Jordan Schroeder each have ten. Rookie defenseman Lucas Carlsson has been a bright spot, with seven goals and 15 helpers. Darren Raddysh has identical numbers, though he had just a single point in his last 12 games. Alexandre Fortin assisted on Broadhurst’s game-winner Saturday. The trouble is that was his first point in a month. As was the case last year, Fortin hasn’t made an impact on the scoreboard, with just six points (2 G, 4 A) in 21 games. Well…the sands are running out on me this week. Rockford hosts the Wolves this Friday, then visit Milwaukee Saturday. 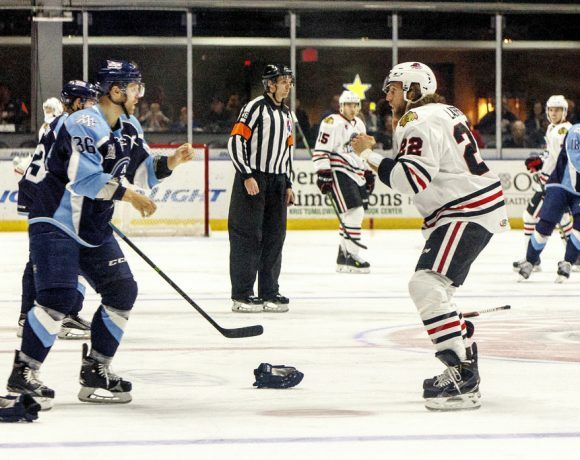 With two wins to close out the month, perhaps February is more hospitable to the IceHogs. Follow me @JonFromi for tidbits on the Hogs throughout the season. High On The Hog: Fighting Fading In Rockford?